Not to be confused with Flag of Dominica. Version with aspect ratio 5:8. Coat of arms of the Dominican Republic. The flag of the Dominican Republic represents the Dominican Republic and, together with the coat of arms and the national anthem, has the status of national symbol. The blue on the flag stands for liberty, the white for salvation, and the red for the blood of heroes. The civil ensign follows the same design, but without the charge in the center. The flag was designed by Juan Pablo Duarte. 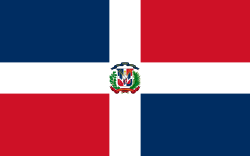 As described by Article 21 of the Dominican Constitution, the flag features a centered white cross that extends to the edges and divides the flag into four rectangles; the top ones are blue (hoist side) and red, and the bottom ones are red (hoist side) and blue. The national coat of arms, featuring a shield with the flag design and supported by a bay laurel branch (left) and a palm frond (right), is at the center of the cross. Above the shield, a blue ribbon displays the national motto Dios, Patria, Libertad (English: God, Fatherland, Liberty). Below the shield, the words República Dominicana appear on a red ribbon (this red ribbon is depicted in more recent versions as having its tips pointing upward). In the center of the shield, flanked by three spears (two of them holding Dominican banners) on each side, is a Bible with a small cross above it and said to be opened to the Gospel of John, chapter 8, verse 32, which reads Y la verdad os hará libres (And the truth shall make you free). ^ a b "Dominican Flag". Worldatlas. Retrieved 18 March 2018. This page was last edited on 18 March 2019, at 17:30 (UTC).